'The True Military Record of John McCain' - Truth or Fiction? A viral, anonymous blog post about the former Arizona senator’s past argues that he was not a true war hero. 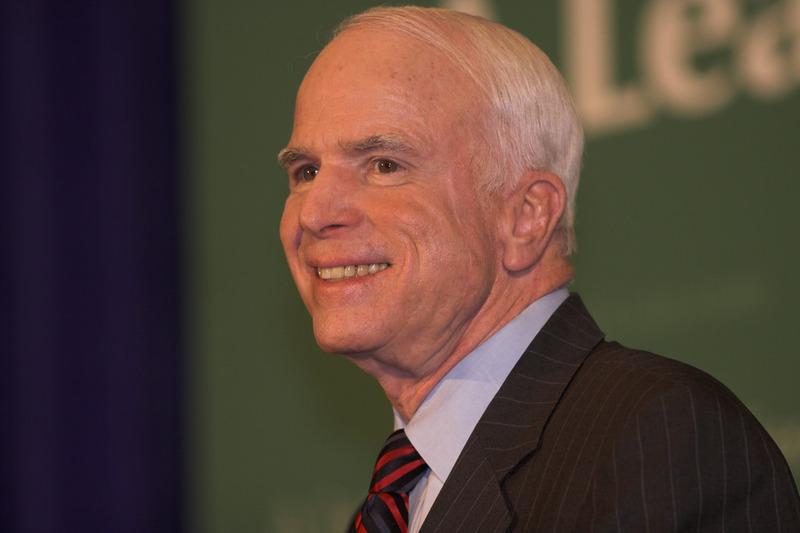 Former Arizona senator John McCain inflated or lied about his military record. Claims about John McCain first surfaced during the 2008 presidential election then were resurrected July 2015 when Republican contender Donald Trump said McCain was only considered a war hero because he had been captured during the Vietnam War. McCain died of brain cancer in August 2018, but that did not stop Trump, now United States president, from attacking him and his legacy. The idea that McCain was inflating or lying about his military record first appeared in a blog post (which has since been removed, but can still be viewed here) titled, “The True Military Record of John McCain, Written By an Active Marine” in 2008. But the so-called “active Marine” that penned the blog is unnamed, so we can’t verify its authorship, nor does it offer citations. However, we were able to fact-check some of its claims. McCain was promoted to squadron commander at Cecil Field in Jacksonville, Florida, in 1976 — after he spent five years in captivity at the “Hanoi Hilton” in North Vietnam. Also, the crash in North Vietnam was his fifth as an airman, not his third. The claim that Cecil Airfield was named after his grandfather is also false. McCain’s paternal grandfather’s name was John McCain Sr., and his maternal grandfather was named Archie Wright. However, McCain’s father and grandfather were both decorated airmen. Fiction. There’s no record of exactly how many hours McCain spent flying combat missions in the Vietnam War. He was, however, shot down and captured while flying his 23rd combat mission on October 26, 1967. McCain attended the U.S. Naval Academy from 1954 to 1958, and was commissioned as an ensign in June of that year. He retired in April 1981 with the rank of captain. In that time he received 17 awards and decorations. Besides the Silver Star Medal, McCain also received the Legion of Merit with a combat “V” and one gold star, a Distinguished Flying Cross and a Bronze Star Medal with a combat “V” and two gold stars. Several citations mention his achievements either as a prisoner or as a lieutenant commander flying bombing runs off the deck of the USS Oriskany. Some are signed by then-Secretary of the Navy John Warner, who would become a colleague of McCain’s in the Senate. Although his aircraft was severely damaged, he continued his bomb delivery pass and released his bombs on the target. When the aircraft would not recover from the dive, Commander McCain was forced to eject over the target. Years later, as his Navy career approached its end, McCain received the Legion of Merit Medal. By then, his missions were in the halls of Congress as a liaison to the Senate from the Navy’s Office of Legislative Affairs. Truth. It’s true that John McCain graduated near the bottom of his class at the U.S. Naval Academy in 1958. Some reports say that he graduated 790th out of 795 students. This is quite an unexpected honor for a Naval Academy midshipman who graduated fifth from the bottom in the Class of ’58. All those years ago, when I was a midshipman, I indulged in the normal daydreams of a young man about what kind of honors awaited me later in life. Everyone’s definition of a “war hero” varies, but the now-defunct blog post makes a number of direct accusations about McCain’s war record that can be easily fact-checked, which makes it all that much more puzzling that it is still being passed around as of 2019. THE TRUE MILITARY RECORD OF JOHN MCCAIN WRITTEN BY AN ACTIVE MARINE. McCain has never really earned anything. He is from a wealth pampered background and not fit to lead this nation. A “war hero” doesn’t finished 894th out of 899 and still get stationed at a Navy champagne unit and promoted ahead of all but two of his 898 other classmates. The question really is how many guys got that number of medals for not being shot down.” For years, McCain has been an unchecked master at manipulating an overly friendly and biased news media. The former POW turned Congressman, turned U.S. Senator, has managed to gloss over his failures as a pilot by exaggerating his military service and lying about his feats of heroism. McCain has sprouted a halo and wings to become America’s POW-hero presidential candidate. This article was written by an active, unnamed Marine. It was published by Gale Toensing founder of the Corner Report.com and she sent it to me. It is a true account of McCain’s real war record and evidence of his lack of fitness for the office of President. Donald Trump Joked About Dating His Own Daughter-Truth! Confederate Soldiers Are Considered U.S. Veterans Under Federal Law-Truth!